Now more than ever, Christian retailers need to be at the top of their game when it comes to helping shoppers choose the right Bible.The cornerstone product remains the area where Christian stores should be able to outshine other channels and cement their place in consumers’ minds as the specialist place for God’s Word. Additionally, the Bible department is widely seen as one reading category more immune to being impacted by digital publishing because most shoppers still want a physical copy of the Scriptures, even if they have an e-version for convenience. But the rising opportunity in Bibles comes when it may never have been more challenging for stores to take advantage of it—as reduced staffing levels leave less time for frontliners to keep on top of new products and releases, and the number of SKUs continues to grow. Teen Bibles may not top best-seller lists or command huge endcap displays like adult editions, but the subcategory is a strong area for publishers and retailers. The segment has come far since The Way, the first teen/young adult Bible, published by Tyndale House Publishers in 1972, which used the Living Bible paraphrase and black-and-white photos of 16- to 30-year-olds throughout the text. The grouping now offers a variety of trendy features and formats—including graphics, colors, compact-size and magazine-like versions as well as metal, manga-style and Italian Duo-Tone designs—all aiming to be visually appealing and teen-friendly to encourage young adults to read the Scriptures. It has probably never been truer for the Christian products industry that change is here to stay. From the accelerating digital-publishing revolution and its impact to ongoing shifts in retail, new consumer habits and business practices are emerging. Christian retailers and suppliers must look to the future, preparing for its challenges and opportunities. We talked to a broad range of industry leaders and insiders to get their personal and professional take on some of the big issues and questions. Specials/discounts: 60%, net 45 on show orders. Special events: signings: Gene Krcelic, Loves Like a Hurricane, Mon., 11 a.m.; Sammy Tippit, The Race, Mon., 2 p.m.; Steven Sellers, The Sobering Truth, Mon., 3:30 p.m.; Mark Ashe, Your Money and Your Life, Tues., 11 a.m.; Beth Marshall, A Time to Heal, Tues., 1:30 p.m.
New products: The Race; Loves Like a Hurricane. Specials/discounts: 55% off, free freight, net 60 days billing. Premiums: book giveaway: First 80 customers receive Young Adult novel Map Across Time by C.S. Lakin. Special events: reading of Sword in the Stars by author Wayne Thomas Batson at booth, Tues., 10:30 a.m. followed by book signing. New products: Stories of Faith & Courage From the Vietnam War (“Battlefields & Blessings” by Larkin Spivey. Specials/discounts: extra discounts on show orders. Premiums: free gift with qualifying order. Specials/discounts: Visit booth for show specials. Special events: book signings: Over the Edge, Brandilyn Collins; Beside Still Waters, Tricia Goyer; Spiritual Leadership, Henry and Richard Blackaby; When Worlds Collide, Mike and Daniel Blackaby; The Resolution for Men samplers, Stephen and Alex Kendrick; and Courageous Living, Michael Catt. Special events: author signings by Pat Williams, Dale Cramer, Elizabeth Musser, Mark Bertrand and Ann Tatlock.
? ?New products: New titles include The Mercy by Beverly Lewis and Have a New Kid by Friday by Kevin Leman. Specials/discounts: Special #1: 60% discount on solid or assorted cases of “Bible Promise” books; Special #2: 60% discount on any 24 copies of Oswald Chambers’ My Utmost for His Highest (excludes promotional editions). Special events: book signings by Wanda E. Brunstetter, Love Finds a Home, Mon., 10-11 a.m.; Tony and Penny Monetti, Called to Serve, Mon., 3:30-4:30 p.m.; Stephen M. Miller, The Complete Visual Bible, Tues., 10-11 a.m.
New products: Growing Up Colt by Colt McCoy and Brad McCoy with Mike Yorkey; 40 Days to Better Living: Optimal Health by The Church Health Center; God Calling: Expanded Edition by A. J. Russell, ed. ; and Love Finds a Home. Specials/discounts: free freight on show orders for delivery in 2012. New products: products by Suzi Skoglund, Barbara Lloyd and Deb Strain. Specials/discounts: Enroll in the engraveable cross program and receive a free store display. Premiums: free mustard-seed lapel pin for first 500 visitors, commemorative 2011 ICRS sterling-silver charm available for purchase. New products: Collections, including licensed NOTW and Truth Soul Armor jewelry, EMI Songs of Worship designs and mustard-seed collection. Specials/discounts: free freight on orders more than $100. New products: children’s product for Christmas. Specials/discounts: 50% off show orders and 20% off UPS charges. New products: Bible Taboo and GlowCrazy: Bible Edition games. Specials/discounts: level discounts and free product. Premiums: free gift to first 35 stores who place orders. Special events: 35th anniversary events. New products: New art series, limited edition best-sellers, gift line by artist Sandra Kuck and more. New products: My Catholic Book of Bible Stories. Specials/discounts: Up to 56%, free freight with qualifying order. New products: The fifth book in John Eckhardt’s “Prayers That” series, Prayers That Activate Blessing. Specials/discounts: Responding CD/DVD, split track, Respondiendo CD (Spanish version of Responding) and songbook package deal, $35. Valued at $62.99. Special events: Dennis Lindsay book signing at booth, Mon., 2-3 p.m.
New products: Lindsay’s The War on the Authority of Scripture. Specials/discounts: 50% and free freight on all orders more than $100. New products: Carine Mackenzie’s 150th published book. Specials/discounts: up to 55% discount, free freight and delayed billing on qualifying orders. New products: The Story Bible. Specials/discounts: 5% pass-through special from NowBible distributors. New products: KJV Scourby dramatized NowBible editions. New products: Courageous, spring 2012, Peanuts. Specials/discounts: free freight on 15 items or more. Premiums: giveaways, and register to win an iPad with $500 purchase. Special events: signings: Tricia Goyer, Cara Putman, Melody Carlson, Robin Jones Gunn, Susan May Warren, Dan Britton and Jimmy Page. New products: “Pocket Inspirations” series. Specials/discounts: 50% discount and free freight on show orders. Special events: signings: John Eldredge, Beautiful Outlaw, Mon., 10 a.m.; Ted Dekker and Tosca Lee, Forbidden, Mon., 11 a.m.; Ted Dekker, The Priest’s Graveyard, Mon., 2 p.m.; Lavaille Lavette, 86,400, Mon., 3 p.m.; Adina Senft, The Wounded Heart, Tues., 10 a.m.; Bill Scott, The Day Satan Called, Tues., 11 a.m.; Debbie Viguie, Kiss of Night, Tues., 1 p.m.
Specials/discounts: 50% off show orders. Specials/discounts: Show Only Sale, with the lowest prices of the year. Premiums: multiple 48 shirts, giveaways. Specials/discounts: 5% off $500 and 10% off $1,000 orders. New products: inspirational frames, canvases and ornaments. Specials/discounts: free freight on $200 net book order, excluding VBS and Sunday school curriculum. New products: Raising a Soul Surfer by Cheri Hamilton. Specials/discounts: 40th anniversary celebration: 60% off retail at a $400 minimum order and incentives to buy from sister companies Gund and Enesco. Premiums: giveaway of three prize packs of products worth $1,500 retail. New products: Bible covers, totes, baby and garden gifts and more. Specials/discounts: 5% discount on net cost if paid within 20 days of invoice. Christmas orders totaling $300 or more ship August or later, payable Dec. 15. Dating specials available upon inquiry. Premiums: Complimentary mahogany pocket token, $2.50 retail. New products: 15 designs of mahogany pocket tokens. New products: titles by Germaine Copeland, Tony Cooke, Dave Martin, Anne Gimenez and Tom and Maureen Anderson. New products: The Power of a Praying Wife Devotional by Stormie Omartian, Victory in Spiritual Warfare by Tony Evans, God’s Heart for You by Holley Gerth, The Amish Nanny by Mindy Starns Clark and Leslie Gould, Raising a Daughter After God’s Own Heart by Elizabeth George, Honestly by Johnnie Moore and The Story of Your Life by Matthew West and Angela Thomas. New products: seasonal and general worship bulletins. Specials/discounts: discounts up to 92%. Specials/discounts: 52% discount, free freight, 90 days with 50-unit minimum. Premiums: free copy of Abundant Simplicity by Jan Johnson. Special events: author signings: Richard Foster, Mon., 11 a.m., and Adele Calhoun, Tues., 11 a.m.
New products: Sanctuary of the Soul by Foster; Invitations From God by Calhoun. Premiums: free exclusive Courageous movie T-shirt. Special events: Meet the makers of Courageous at our 3:16 event with drawings and giveaways, Mon., Tues., at 3:16 p.m.
Special events: events with Marvin Olasky, Eric Wilson, Ninie Hammon, Doug Peterson. New products: Babylon graphic novel by Art Ayris, Five Days in May by Hammon and Echoes of Eden graphic novel by Olasky. Specials/discounts: 70% on qualifying orders for King James Version, leather Thompson Chain-Reference Bible. Premiums: gift with every order. New products: The Thompson Answer Bible. Specials/discounts: Choose your discount: 50-54% off plus extended terms, free freight on qualifying orders. Specials/discounts: several levels of specials. New products: David & Goliath sculpture plaque. Specials/discounts: cash rebates on selected products (double Monday), discounts, free freight. New products: Bible Hi-Gliders, Verse-A-Light flexible LED light, Extra Large Print Rainbow Bible Tabs. Specials/discounts: free membership at the show ($200 savings). Special events: signings: Kathi Macias, Jennifer Kennedy Dean and more. Specials/discounts: Mon., Tues.: 55%, free freight, 60-day billing. Wed.: 50%, free freight, 60-day billing. Premiums: Already Compromised, The Defender’s Guide for Life’s Toughest Questions, Church Diversity: Sunday, the Most Segregated Day of the Week. Special events: book signings: Mo., Ken Ham, 11 a.m.; Tues., Ray Comfort, 10 a.m. and Scott Williams, 3 p.m.
New products: Already Compromised by Ken Ham. New products: Tempered Steel and 50 Questions-50 Answers DVDs. Specials/discounts: half off shipping for orders more than $200. New products: John Bunyan’s Sighs From Hell. Specials/discounts: 52% and free freight on 15 assorted titles. New products: Five Languages of Appreciation by Gary Chapman, Have a New Teenager by Friday by Kevin Leman, Courageous. Specials/discounts: 50% discount on four-pack of “Adventures in the American Revolution” series; introductory $9.99 price on Taken for quantities of five or more with counter display. Special events: signings: Susan Olasky, “Adventures in the American Revolution” series, Tues., 10 a.m.; Kathleen Buswell Nielson, Isaiah (“Living Word Bible Studies”), Tues., 1 p.m.; Brock Eastman, Taken, book 1 of “The Quest for Truth,” Tues., 3 p.m.
Specials/discounts: up to 50% off, extra dating and free freight. New products: Gotta Have God, Volume 3 for ages 2-5, 6-9 and 10-12. Specials/discounts: free freight with prepaid orders, minimum $1,000; free product giveaway on orders $500-plus. New products: new items in the “Textured Artboards” line, as well as new frescoes with metal crosses and turquoise embellishments. Specials/discounts: 50% and free freight on NYP, new pamphlet promotion, big discounts on DVD curricula. New products: DVD-based small group curriculum for Feasts & Holidays of the Bible; and Life of Moses, Book of James and Prayer pamphlets. Specials/discounts: show specials, including Slap Watch display program. New products: Slap Watch display program. Specials/discounts: free shipping on qualified orders. Premiums: Stop by the booth for SillyCone Bandz. New products: 20 stainless steel rings starting at $1.79. New products: stainless steel rings, necklaces and bracelets, all bearing scripture. Specials/discounts: 50% off Bible product. Premiums: free KJV MP3 Bible with $100 minimum purchase, free shipping with minimum order. Special events: giveaways: Envoy Solar Bible, “Treasure Chest” CD series. New products: Updated Envoy Solar Audio Bible, “Treasure Chest” CDs, Volumes 1 and 2, in English and Spanish. New products: VeggieTales Bible indexing tabs, Scratch’n’Smell stickers, character stickers, temporary tattoos and Very Veggie Values. Specials/discounts: discounts up to 52% on qualifying promotions. Special events: signings Mon., Tues.
New products: Game On by Emmitt Smith, NLT Parallel Study Bible, One Year Study Bible and The Tehran Initiative by Joel C. Rosenberg. Specials/discounts: free shipping and special dating. New products: Greeting cards featuring animals with scripture, seasonal packages for trick-or-treat, Thanksgiving and Christmas. Special events: book signings and giveaways Tuesday. New products: tween/teen fiction books and church supplies. Specials/discounts: U.S. only, 55%, no minimum. New products: 55 titles by A.W.Tozer. Centered on the theme “Celebrate the Word, Impact the Culture,” the International Christian Retail Show (ICRS) marks its 62nd year July 11-13 at Atlanta’s Georgia World Congress Center. This year’s focus, in part, celebrates the impact of the King James Bible, in its 400th year of publication. Open to the public for viewing, the Celebrate the Word Bible Legacy exhibit of historic Bibles and biblical artifacts “will help reinforce Christian-stores’ role in bringing the Bible to people today, and the significant role they play within our culture and communities across the country,” said Curtis Riskey, executive director of show-host CBA. Michelle Brown believes so strongly in church supplies that last fall she dedicated a section of her 1,800-square-foot location to this category to stimulate more interest in Word of God Christian Resources. The outreach is working. During 2010, the store derived 48% of its revenue from church supplies. That nearly matched 2009’s figure of 51% despite a third consecutive annual decrease in giving to churches nationwide. While talk about digital products generally makes brick-and-mortar Christian retailers quite nervous, they should be encouraged when it comes to non-print formats available in their Bible department. For many have experienced success with sales beyond the printed page in recent years, and though the growth of e-books is viewed as a threat to other categories, when it comes to God’s Word, some see the trend as less troubling and even potentially positive. Long before e-readers, Christian stores were selling the Bible in non-print formats, from audio editions on multiple cassettes to early software. Listen-to versions got a major boost in the last few years when the two leading Bible publishers each brought out their own, award-winning digital audio editions with all-star casts. With more than 2 million in sales, a children’s version due to release in November and a movie adaptation, Heaven is for Real (Thomas Nelson) has been one the surprise hits of the Christian publishing world, since its release last fall. Like William P. Young’s best-seller The Shack, it is one of those titles that has been propelled more by word-of-mouth recommendation than advertising and promotion. We talked with representatives of publishers of similar titles, which have racked up sales of more than a million without a major marketing push, about handling such unexpected successes and the role Christian retail stores have in their impact. CHRISTIAN RETAILING: How did your million-seller hits come about? WOODLEY AUGUSTE: I think it was the popularity of books based on the afterlife and the supernatural. In light of current events, people are asking some questions about faith—most importantly and of course—the afterlife. Books like 23 Minutes in Hell that are in that genre meet that felt need. I think that as things seem to become more chaotic, people were intrigued by asking the question, “Is heaven or hell real?” A book by a realtor that was not a preacher—was just an “Average Joe,” if you will, recounting a vision—I think it really piqued people’s interest. Prominent atheist Christopher Hitchens, author of God Is Not Great (Grand Central Publishing/Hachette Book Group), offers his take on the King James Version's 400th anniversary. The pro-marriage hit Fireproof (Provident Films/Provident-Integrity Distribution) shot up to the top of the SoundScan Christian Videos list for sales the week ending Feb. 1, while Gaither Vocal Band Reunion Volume One (Gaither Music Group/EMI CMG Distribution) reached No. 1 on the Christian/Gospel music Christian retail chart. 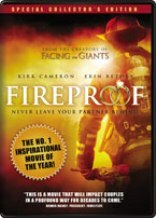 After Fireproof , the best-selling DVDs were: 2. Facing the Giants (Provident Films/Provident-Integrity); 3. Gaither Vocal Band Reunion Volume One (Gaither Music Group/EMI CMG); 4. Gaither Vocal Band Reunion Volume Two (Gaither Music Group/EMI CMG); 5. Flywheel (Provident Films/Provident-Integrity); 6. Alligator Hunter, Life at the Pond (Isaac Entertainment/Word Distribution); 7. The Gift of Christmas, Really Woolly (Flying Rhinoceros/DaySpring); 8. The Second Chance (Provident Films/Provident-Integrity); 9. Wow Gospel 2009 by various artists (Wow Gospel/Provident-Integrity); and 10. Love's Enduring Promise (Twentieth Century Fox Home Entertainment/Word). As Christian suppliers and retailers face a slump in consumer spending, they are looking to children’s products as a bright spot on a gloomy horizon. A strong line of new releases and innovative marketing efforts offer hope for the spring and summer seasons, while stores have been urged to ensure that they cater to the tastes of increasingly media-savvy young visitors.